The Red Bull Elektropedia Awards are the Oscars of Belgian nightlife, with a kickass award ceremony and party. So Fisheye VR got very excited when Red Bull approached them to create the VR Teaser for the event. The theme of the year was Artificial Intelligence, so Fisheye VR came up with something special to build anticipation and excitement. The invitation was a pair of VR glasses, with a 360|VR video created just for the occasion, which starred Belgian techno DJ’s Beauhause. 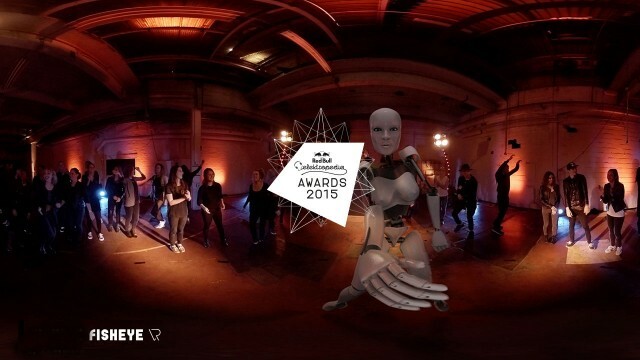 The Red Bull Elektropedia Awards 360 video brought viewers into the middle of an underground futuristic party. The people and a dancing droid are beamed into the room, and then the party starts. For the shoot we built a set of lights that were programmed in advance. 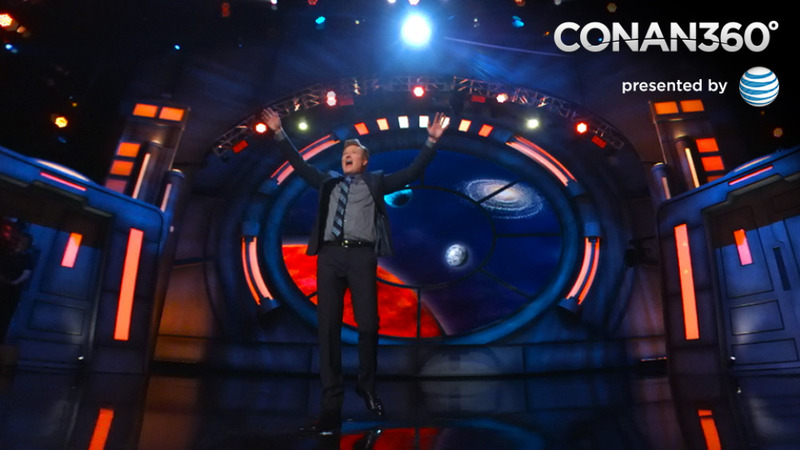 This was important because we needed to combine different takes into one continues shot, so the programmed lights helped to blend them all together. 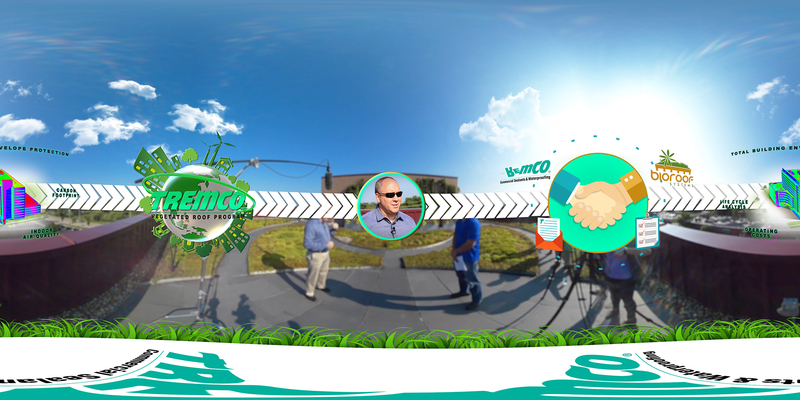 We brought the 360 video in 3D to further light the scene and add reflections. 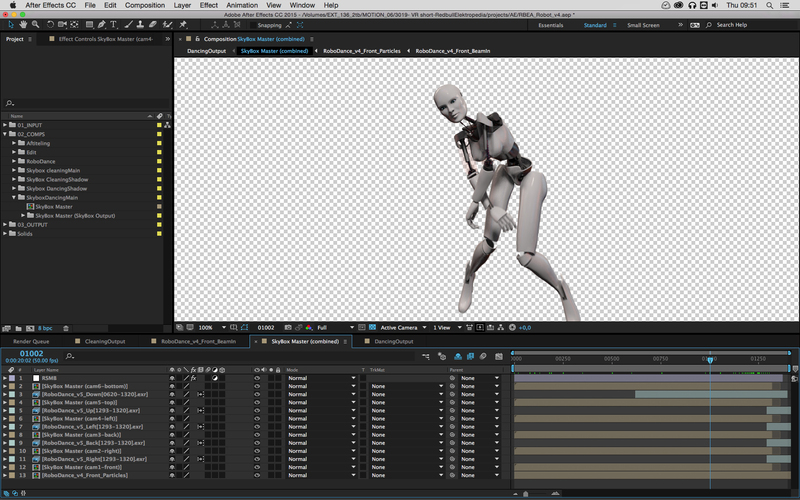 This helped in compositing the CG renders with the live action footage, because of the complex light setup. To keep the lighting in the scene as constant as possible, we shot the video in the evening. After a few drinks and some rehearsals, the shoot felt like a real party. Luckily we had our cleaning crew with us, which you can see towards the end of the video. 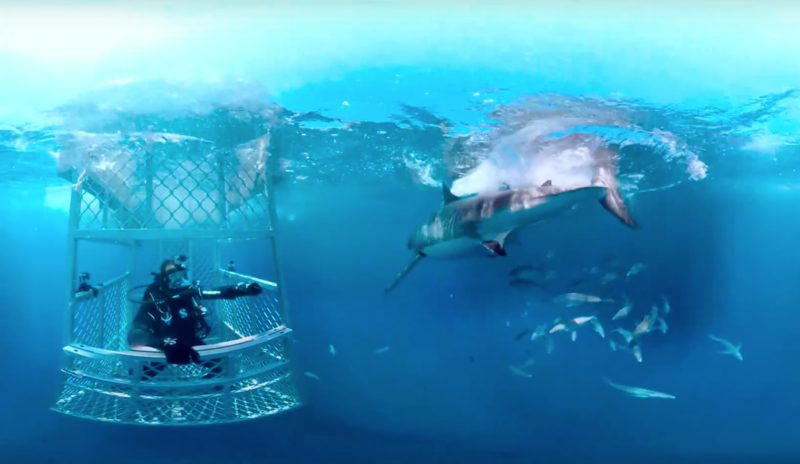 For us, this was the first project to really combine CG with live-action footage and composite it all together into one VR-experience. Before mettle’s Skybox Studio was released, we had to pass every graphic into our 3D software to get an equirectangular image, which was a real hassle. Thanks to Skybox Studio, we were able to keep a tighter workflow in compositing the 3D-renders with the 360-video, and integrating the graphics. 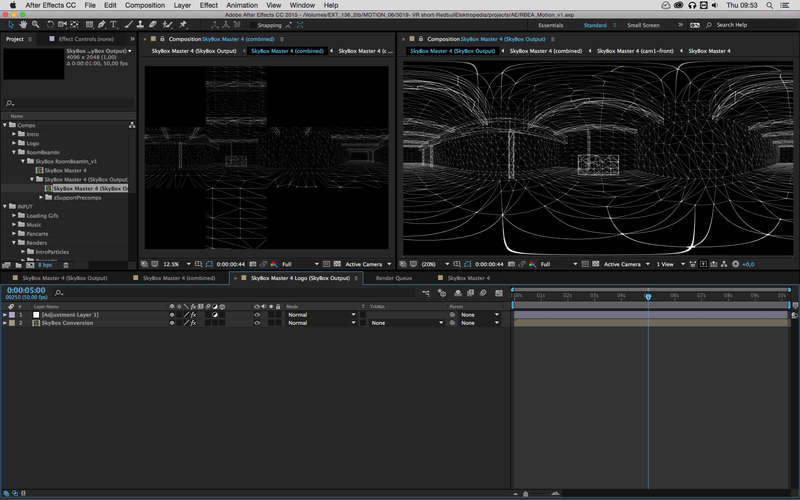 It was great being able to use the familiar tools in After Effects to work with 360 degree footage. 360 graphics created in After Effects with SkyBox Studio. 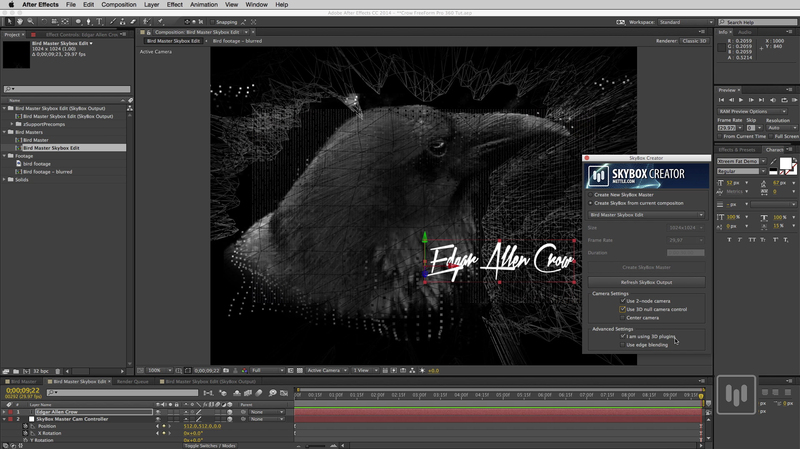 360 Compositing in After Effects with SkyBox Studio. 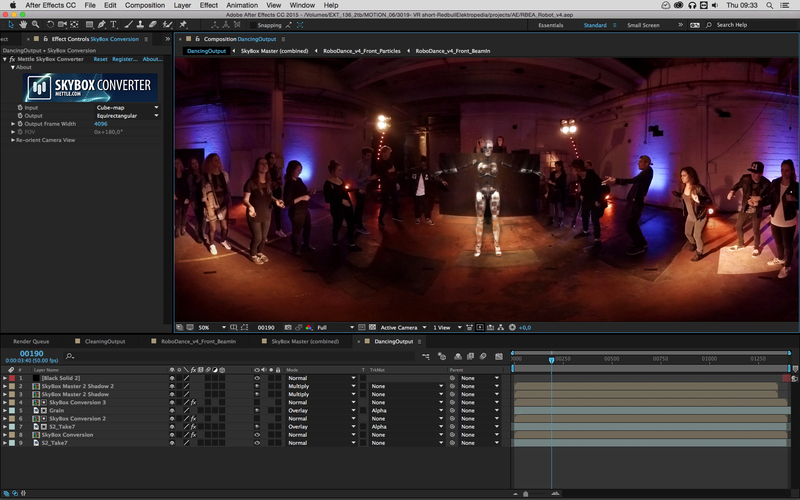 Fisheye VR combined CG with live-action 360 footage in Adobe After Effects, with SkyBox Studio. Fisheye VR is a Virtual Reality production studio in Belgium for Oculus Rift and Samsung Gear VR and Web.